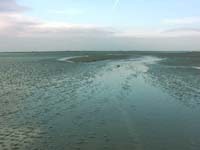 Havengore Creek provides a route between the Thames Estuary and the rivers Roach and Crouch, without the need to go East around the Maplin Sands and Foulness island - a saving of some 15-20 miles. It has been used for centuries by coastal vessels, notably the East coast sailing barges. It is, however, only suitable for shoal draft boats and experienced skippers. In strong winds with a southerly element, this route is not a good idea; but in the right circumstances it is an interesting and time-saving route. 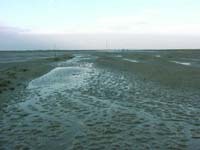 The Maplin sands, which must be crossed to access the creek, are a Ministry of Defence firing range. Refer to the notes on your chart or pilot for current details of flags and signals. 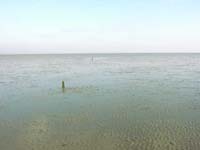 Most boats crossing from the Thames go between the artificial island (near S. Shoebury buoy) and the Blacktail West post. 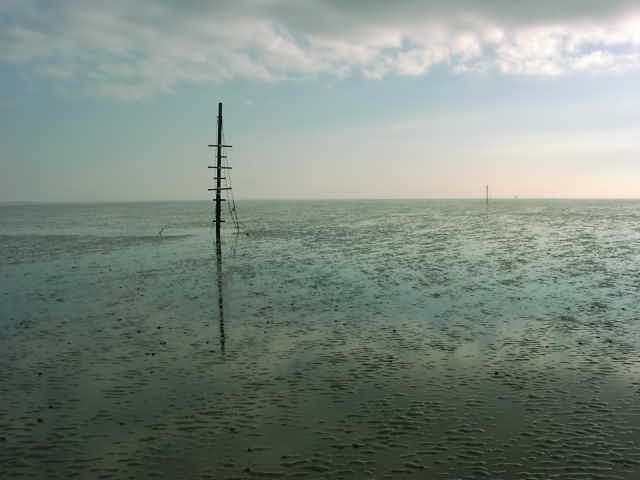 On this route there are a number of large posts which were presumably once intended to be a guide to the best water. There is at least one marked wreck near the route, and may be other unmarked obstructions from time to time. 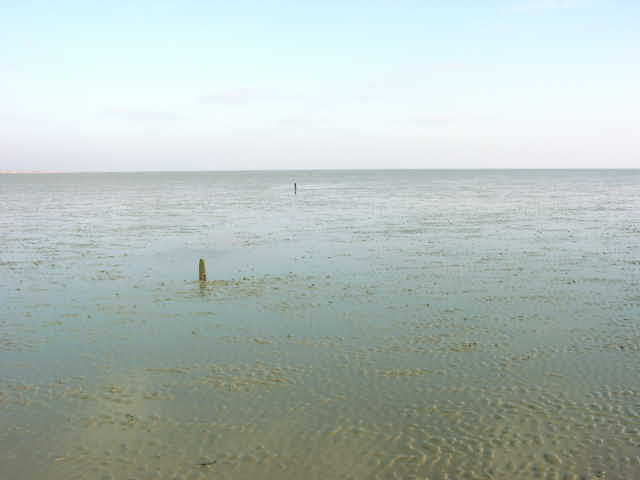 Those with local knowledge sometimes cut across the sands from the Inner Shoebury beacon. 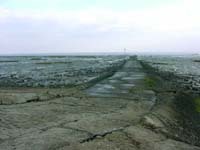 The Broomway, an old road which is still a public right of way, crosses the sands about half a mile from, and parallel with, the sea wall. The road is indiscernible from the surrounding sand in most places, apart from an occasional short post, so it does not obstruct navigation. However there is a sand bar across the creek entrance itself, rising a metre or so above the surrounding sands. There are channels through this bar, and one is normally marked by red & green steel withies. The best water channel inside the bar is to the centre of the creek, favouring the NE side. 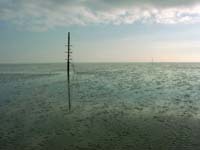 In a number of places near the sea walls are metal obstructions which are to be avoided. 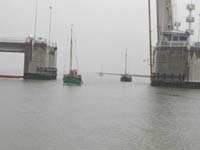 In the creek entrance is the Havengore Bridge, a lifting bascule type, operated by the MOD. Unless the ranges are in use, the bridge is normally manned 1-2 hours each side of high water during daylight hours. Vessels intending to use the creek should contact the bridgekeeper on VHF 72 (callsign "shoe bridge") . On a number of occasions in recent years, the bridge has been out of action, so it's a good idea to check. The bridge keeper usually notes the name of each vessel passing through. Just inside the bridge, the way divides on two sides of Rushey Island. The southern way is rather shallow, so most vessels take the Narrow Cuts which is marked with withies. Opposite the end of the Narrow Cuts is Potton Island; the route North from here runs directly to the Roach. 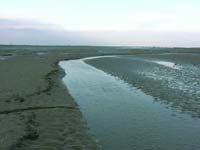 The southern route round Potton is more tortuous and shallow, but leads through a swing bridge to the Roach above Paglesham, and to Barling. 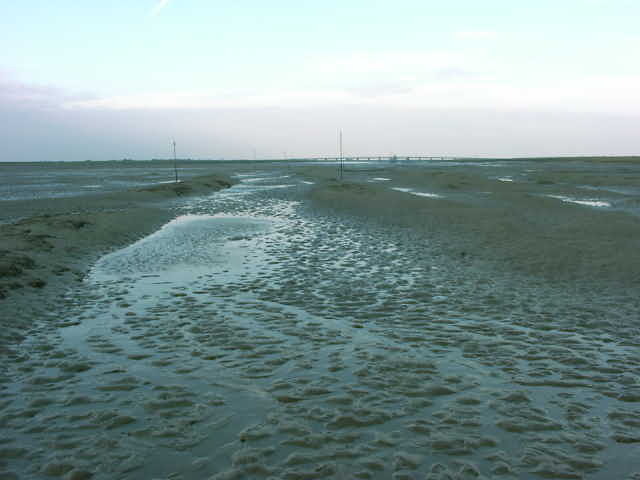 The pictures below were taken at low water in January 2005. The Broomway looking North East about half a mile from Wakering Stairs. A few wooden posts remain to mark the way at this point. Steel post with guys and rungs. This one marks the point where the Broomway crosses the Havengore route. A view into Havengore entrance. The withies marking the way across the sand bar are on the left of the picture. This channel is to the NE of the marked route, and seems to be deeper. However it winds about a lot and would be hard to find when covered. The same channel about 40 metres further in. To the left, the marked channel is hummocky and poorly defined. The ground in this area varies in height by about 1 metre. 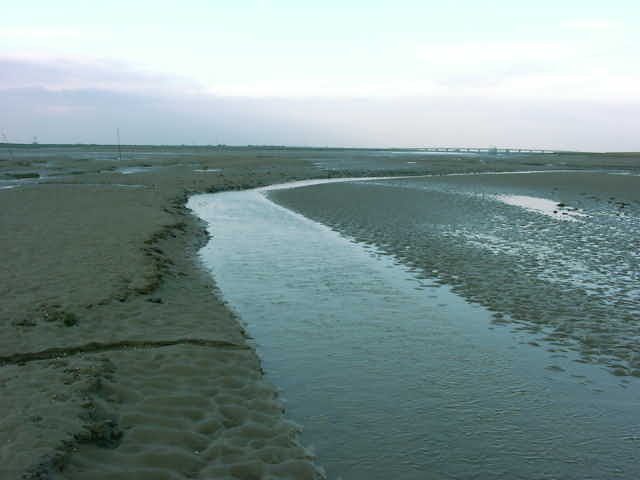 The marked channel on the inner part of the sandbar. Here it is better defined and clear of obstruction. Wakering Stairs, the landward end of the Broomway; looking E from the sea wall. Boats entering through the lifting bridge into Havengore creek. Any skipper considering this route needs to use an up to date chart showing the creeks of the Roach as well as the Thames estuary. A pilot book such as East Coast Rivers by Janet Harber, and the companion volume of aerial photographs is most useful. The information given here should not be used as pilotage. Both the sands and the marks are susceptible to change, as is the management of the bridge and channel, so seek the latest information before using the Havengore route.